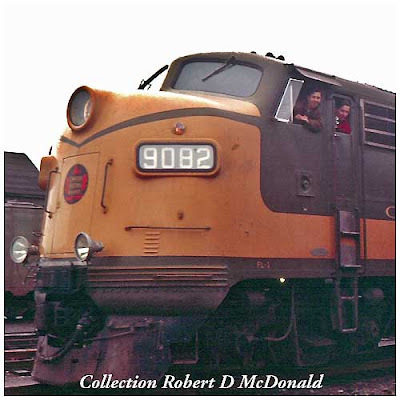 Canadian National Railways 9082A, Prince Rupert, May 31, 1959. I was up in the cab of CNR 9082 showing my newfound friend Mike around, trying to take a picture of the engineer’s controls. Two fellows, one I recognized as Johnny Bateman, climbed into the cab. The older fellow I had seen around, but did not know his name. Mike was several years older me (I was 16) and a right-and-proper Englishman who was a process engineer out at the Columbia Cellulose plant at Port Edward. I was prowling around the yard with my camera and spotted him taking a photo of the 9082. I introduced myself to him and asked him if he had even been up in the cab of one of these things, which he hadn’t, which is why we were now rumbling down the track. While Mr. Bateman and this other fellow were fussing with this and that, I told Mike to go ahead, sit in the fireman’s seat, and fire off his 8mm camera, which he did. Mike became a great friend of the family, my Mom bargaining him his Wednesday night dinners tutoring my younger sister and I in math. As the tides of life ebb and flow, Mike ended up back in England on a family emergency, and never returned to the Colonies. But we have been great phone friends over these many years – and when a lady friend and I were in England in 1999, Mike and I went out for dinner, and finished a bottle of fine Australian wine. A few months ago, I got an email from a reader asking me if I knew the engine numbers of a Canadian National Railways freight train that hit a rock slide, tumbling 100 feet or so down an embankment, killing the engineer and conductor. Two GP-9’s ended up blocking Highway 16 just east of Terrace, BC. 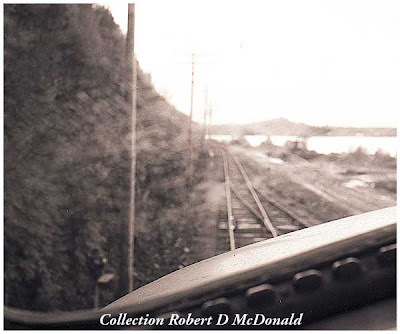 For years I carried the front page account, with photos of the engines, as printed in the Prince Rupert Daily News. As part of this ongoing downsizing campaign, I’ve been tossing stuff out, and that article went to the dump, mere weeks before I was contacted. I had tried to make a .pdf file of the article, but the Prince Rupert Daily News had a screen dot resolution on their press numbering in the low 50’s it seemed. There was just no making a copy of it worth a damn. I did contact the Terrace newspaper, but their files did not go back that far, and so the Internet search went into my cold files. And I was not able to help that fellow out. So much for downsizing. 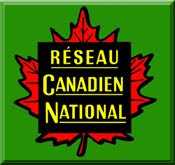 A few weeks ago, I got the bug to Google “Canadian National train wrecks,” and determined to check each page from one end of the search file to the other. After a few dozen pages, I ran into an obscure entry “trainwreck of 78." Of course, it was not the train wreck I was searching for, but I thought the site might have links to other train wrecks. 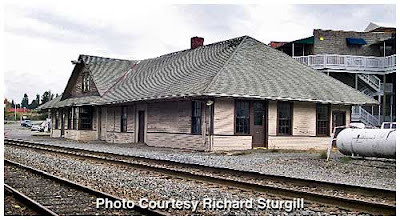 The site has a lot of CNR history in my time frame, and is dedicated to the memory of an engineer by the name of Bateman, killed when a slide hit his locomotive. As I was reading this site, the hairs on my arms literally began standing up. Bateman. Bateman. I knew a Bateman in Prince Rupert! I scanned the negs and sent them off a few days ago, asking the site owner, Ken Bateman, if there was a connection between him and my photos taken in early 1959. And so one of my many adventures has come full circle. 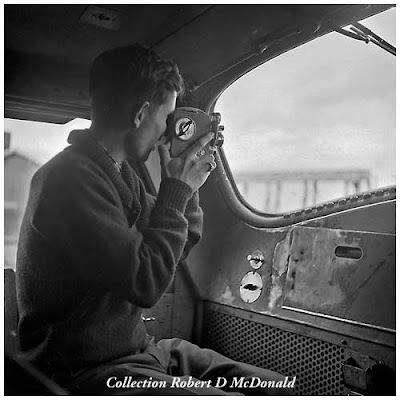 And more important, I’ve connected with Ken Bateman, and been able to provide him with pictures of his “Uncle John” which, I am certain, will enrich his experience. And Mike? Well, we have been chatting on the phone once or twice a month for years. I just talked to him the other day. 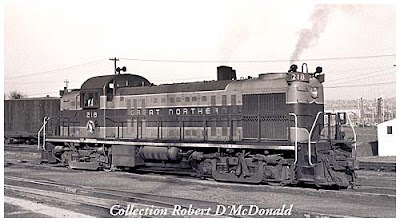 In my previous entry, I described the Canadian National Railways first series of General Purpose – GP-9’s. Big mistake! It was never my intention to give the detailed history of CNR’s GP-9’s. It is just that one thing lead to another, and suddenly I was in over my head! 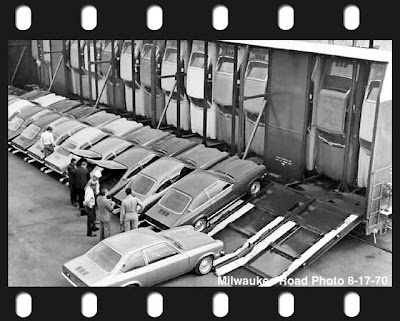 In later years, many or these units, with god only knows how many miles on them, were sent to CNR’s Pointe St. Charles shops near Montreal Quebec for upgrading, a new lease on life. By some accounts – yet to be verified – some 246 units were involved in this rebuild effort over a few years, as funding was made available, resulting in the GP-9RM. Removing the prime mover 1,750 hp GM 16V-567C and installing the GM 16V-645C motor, rated at 1,800 horsepower. The newer motor now available from General Motors provided a slight increase in horsepower with a turbocharger, while removing the Roots gear driven supercharger. Removing the dynamic braking system, including resistance grids and roof mounted 48” fan. The familiar “blister” was retained, behind which, if you look carefully at Tim Ball's featured photograph, you can see the grill-work for the improved air filtration system. And the obvious lowering – chopping, if you like – the short hood, for increased crew visibility. 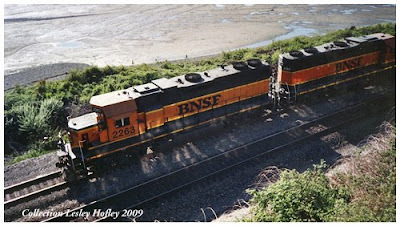 Not for running ahead, mind you, they retained “long nose forward running” configuration, but for backing up! These are the major upgrades, as I understand them. I did not say “complete” list, so if you can ad or comment on this program, use the “Comments” box at the end of the story. I think that once you move beyond the “as manufactured” locomotive types into the murky world of rebuilds and re-powering, you enter shark-infested waters. In the end, only the railroads themselves know the reasoning behind model designations, and it isn’t to make life easy for rail fans. Many times, I find more enlightened and complete information about motive power from “model” railroad enthusiasts as opposed to “prototype” enthusiasts. This I attribute in part to their almost obsessive attention to details. In the end, the model railroader came though, in spades concerning the RM! So just about the time I thought I got it figured out (and I’m not even going to get involved with the GP-7RM’s, or the F7AU’s!) along comes the GP-9u. And then there are the SWEEPS! Bottom line, terminology, abbreviations, acronyms, without definition is worthless. Looking forward to receiving informative comments below! 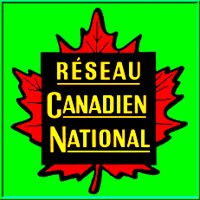 Railroad Stuff: Canadian National 7080RM. Built Canadian National Railways 4121, by GMD in September 1957, serial number A1283, 1,750 horsepower. Renumbered CN 4377 in 1984, renumbered CN 7080RM in 1993. Canadian National Railways 4426, Skeena Subdivision, Prince Rupert, September 1959. CNR 4426 and her partner CNR 4226 will be the power pack on tonight’s time freight to the east. A great example of color accuracy maintained for more than 50 years on a 35mm Kodachrome slide! What is interesting about this unit is that she was in Canadian National’s initial order for General Purpose GP-9’s split between General Motors Diesel (GMD) in London, Ontario and Electro Motive Division (EMD) in LaGrange, Illinois. In all, 196 GP-9’s were ordered, beginning in 1955 with road class GR-17a: G=General Motors, R=Road Switcher, 17=1,750 horsepower, “a” signifying the first order of that class. 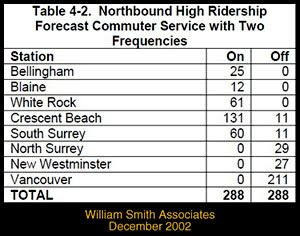 These numbers are the 2nd number assigned these units, re-numbered shortly after entering service. For example, the 4426 was built as 1750, and renumbered to 4426 in 1956! While this photo was not shot to illustrate comparisons between two different GP-9 CNR road classes, it is worth mentioning that the leading unit (CNR ran long-nose forward) CNR 4226 weights about 10 tons lighter than the 4426, running on Flexicoil’s with a dinky fuel tank. Technically, the CNR referred to the lighter units as GP-9L’s, built for branch line lighter rail. The entire Prince Rupert Extension was so designated, some 700 miles! The “garbage can” headlamps were eventually replaced with dual sealed-beams. Since this is a trailing unit, her add-on ditch lights are “in between” the two units. Railroad Stuff: Canadian National Railways 4426, built by General Motors Division (GMD) London Ontario as 1750, April 1955, Serial Number A-669. Renumbered 4426 in 1956. 1,750 horsepower. 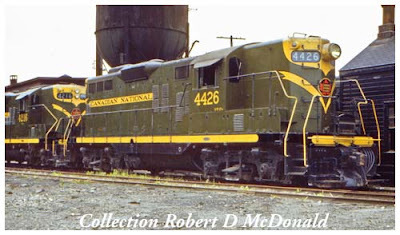 In 1990, 4426 was sent to CN’s Pointe St. Charles Shops in Montreal, rebuilt as Slug 244, and ballasted to maintain maintaining her svelte 240,000 lbs. She was “assigned” to a 7200 Class GP-9RM (Re-Manufactured) forming a “Mother-Daughter” power pack. 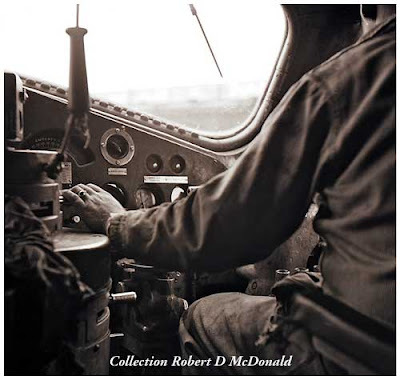 While we are all familiar with Edwin Gowen Budd's ability to fabric a new metal - stainless steel - few are aware that his first "products" were car bodies and aeroplanes! 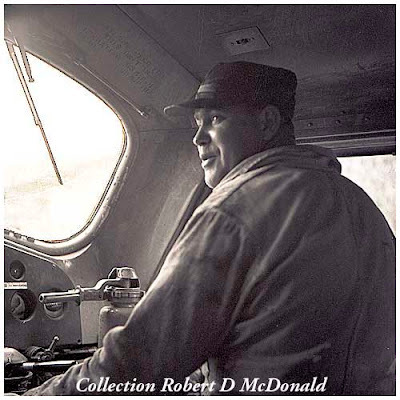 His first self powered rail car, "the Green Goose," was tested on the Reading Railroad in 1932, combining technology from Michelin and Goodyear, incorporating his ability to fabricate carbodies from a strong yet fickle material, stainless steel. 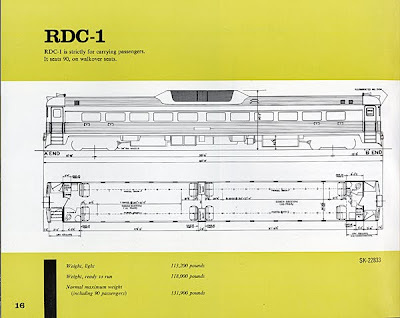 Following several years of prototyping and modifications the final concept was unveiled as s/n 2960, the original Budd Rail Diesel Car 1 - RDC-1 - in August 1949. 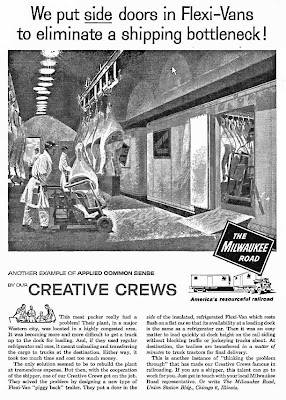 And while the Budd car went on to provide far reaching transportation solutions for many railroads seeking to remove full blown passenger trains from territories that just could not be profitable with smaller passenger demands, some railroads took to the highway to get out from under non-profitable passenger and freight operations. 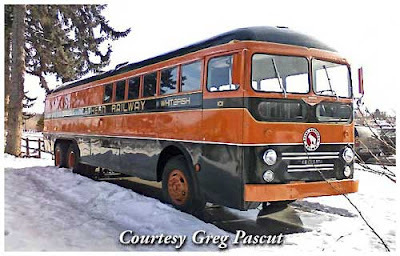 Great Northern Railway was one of them, creating this hybrid passenger and freight combination highway bus to run in remote Montana, the GN 101. 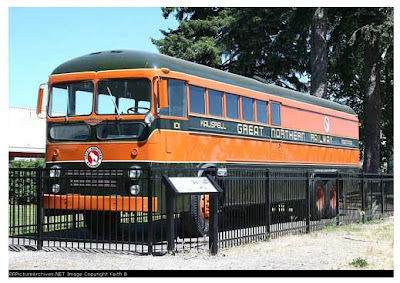 Great Northern's 101 was built to combine passengers and freight on a "branch line" run that wasn't profitable even for a self contained rail car. 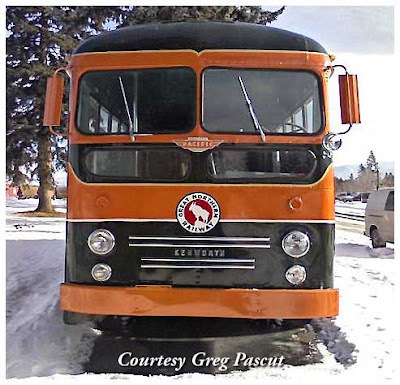 Averaging six round trips, daily, between Whitefish and Kalispell, from 1951 through 1971, the “Bruck” had a capacity for 20 passengers and seven tons of freight. 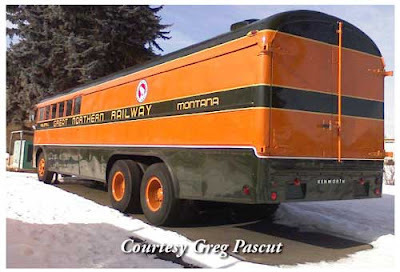 Great Northern 101 was one of a dozen Brucks custom-built by Kenworth Motor Truck of Seattle. All 12 were used in Montana. A Hall-Scott pancake motor powered her, developing 220 horsepower, with a 10-speed manual transmission. An earlier version was built for Northern Pacific Transport, but was a split-level coach. Actually, we can trace the concept of the bruck back to Canada. 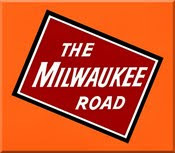 In 1943, New Flyer Industries of Winnipeg introduced what it called the "Bruck," a combination truck and bus. Essentially, a storage compartment accessible from the outside replaced the last rows of the bus by a rear door. New Flyer Industries Inc. is the largest bus manufacturer in North America. And another bus manufacturer, Crown Coach got into the act. Crown introduced a bus/truck hybrid or bruck that combined passenger and freight-carrying capability in a single vehicle. Popular with small railroads, the vehicle was built using their 40’ tandem rear axle chassis. The coach half of the vehicle carried 20-passengers who sat ahead of 20’ deep windowless rear freight compartment that was loaded through a pair of doors at the rear. 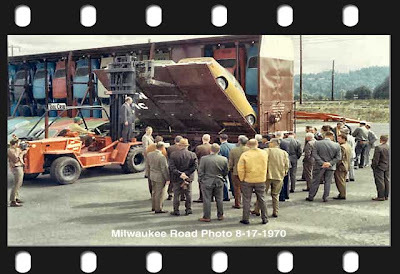 A handful of shorter 35’ brucks were built using a single rear axle and seating for 12. The story of the 101’s mere existence today is remarkable story. The vehicle was discovered at a salvage yard in Great Falls by railroad buff Larry Hoffman of Michigan. 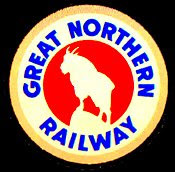 Coincidentally, he was attending a convention of the Great Northern Railway Historical Society. Mr. Hoffman passed away before he could buy the Bruck. But his wife, Connie, purchased the dilapidated vehicle as a memorial to her husband and donated it to Stumptown Historical Society in 1999. Mrs. Hoffman stipulated that the historical society had to restore the Bruck to its original condition within five years. Well look at her now! Yet another tribute to “innovation.” The Bruck was born out the necessity to transport people and goods over a route that just was not profitable, even by an oil electric car. 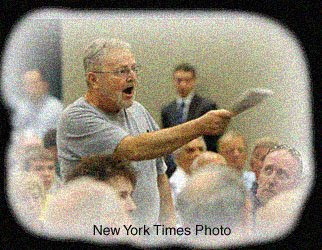 Regardless of who you prefer to attribute this oft repeated saying, we are witnessing fools on a grand scale shouting out, disrupting and in general destroying the purpose of what should have been a forum for civil discourse. Senators and Representatives home for "summer break" trying to conduct open meetings with their constituents, are experiencing an unheard of outbreak of what can only be described as undisciplined rudeness, plain and simple. Public meetings with our elected representatives are to allow face-to-face airing of views and information, far more effective than phone calls, letters, or email. In fact, unlike during the past administration, Republicans and Democrats can share the same venues, regardless of party affiliation. But the unruly mob scenes played out the past few days have given any number of representatives pause for concern – even posing public safety concerns. This may result in an even more serious peril; loosing our freedom to interact with our elected officials, threatened by largely ignorant, ill mannered, and foolish loud mouths. Rayonier, Incorporated #3, Promise Land Park, Humptulips, Washington, June 17, 1960. My sister and I were fortunate to have parents who enjoyed family outings on the weekends. And summers when we were out of school were great because our Dad worked Inland Rules for Puget Sound Tug & Barge, which meant he worked 15 days on, 15 days off. One of our favorite “haunts” was Kalaloch Beach on the Olympic Peninsula. It was a few hours drive from Seattle, down to Olympia, out to Hoquiam and up the US 101 through Humptulips to the beach. After my railroading experiences in Prince Rupert, I was on the lookout for a locomotive of any type. 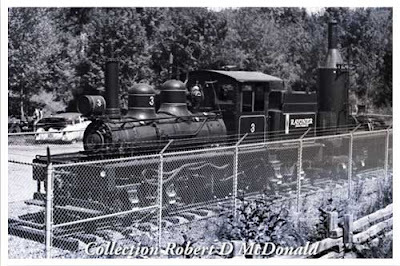 Located in Promise Land Park, at Humptulips, was a display of Rayonier #3 with a flat car mounted donkey engine. I knew zip about what a Shay really was until years later, in 1989 when my late wife and I spent our honeymoon at Cass Scenic Railroad, West Virginia, as part of what they called then, a “Rail Fan Weekend.” The exquisiteness of it was the fact the event was limited to 300 guests, so the mob was manageable, especially on the run-by photo line-ups. I was utterly spell bound watching the pistons and drive train! The nickname “sidewinder,” as applied to the driving mechanism of the Shay locomotive, is so appropriate and fascinating to behold! At once complex, yet so simple! 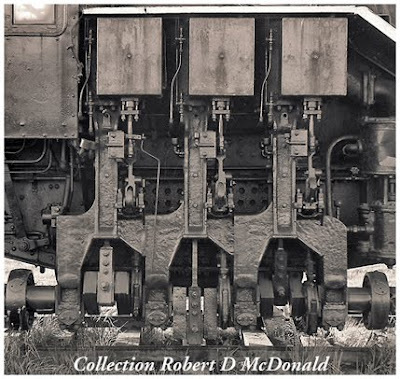 As the years have gone by, I have seen and read about may interesting types of locomotives, but the geared locomotives, developed by loggers simply to get the timber out of the woods over jury rigged trackage, have proven to be the most remarkable to me. And my modest brass collection displays one of each: a Lima Shay, Willamette Shay, Climax, and Heisler. From his early “contrivance” consisting of a simple two cylinder motor fed by an upright boiler driving a flat bed platform with a tank full of water, Ephraim Shay’s 1877 design evolved to the zenith of geared power, as demonstrated by Lima’s Western Maryland #6, which Patti had the enjoyment of watching at Cass. Railroad Stuff: Rayonier, Incorporated #3. 24 ton two truck Lima Shay code “Bay” construction number 2305, built for East Kootenay Logging Company at Cranbrook, B.C., May 9, 1910. 8” x 8” powering 27½” wheels. To Polson Logging Company #3 at Hoquiam, Washington. To Rayonier, Inc., #3 at Hoquiam. To Promise Land Park, Humptulips, Washington. 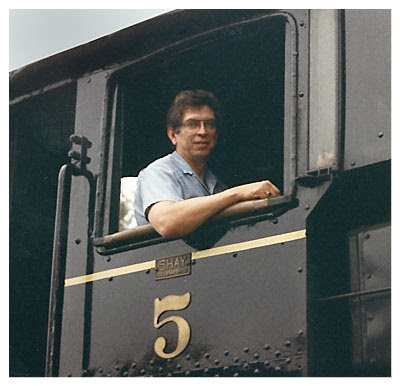 Eventually a fellow by the name of Aaron Zorko, Engineer, Lead Fireman, Mechanic, Conductor, and Web Master at the Oregon Coast Scenic Railroad, in Tillamook, Oregon, purchased #3 in 2002. I talked to Aaron briefly today to find out the status of the old Shay. He is optimistic that funding can be secured to restore her. If you would like to share in that dream, drop Aaron a line and let him know! Ed Note: We have had a recent success story in the restoration and live running of yet another Rayonier locomotive. Willamette Shay #2 is now running at the Mount Rainier Scenic Railroad, as shown here on Railpictures.net. Construction Number 34,the last of 34 locomotives built by Willamette Iron and Steel works in Portland, Oregon. Willamette Iron & Steel did not build the Shay “under license” as many incorrectly report. Indeed, the original Shay patent expired in 1898. WI&S saw an opportunity to supply their West Coast logging customers with more than yarders and donkey engines, and took a shot at it! Lima made several improvements to its Shay, launching the “Pacific Coast Shay” in 1927. The “PC Shay” forced Willamette Iron and Steel to cease building locomotives, and return to it’s more familiar offerings. 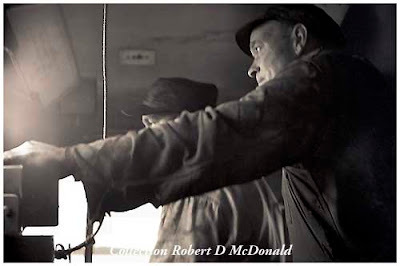 See “The Willamette Locomotive” by Steve Hauff and Jim Gertz for the full and fascinating story of this maverick locomotive. Great Northern 218, Interbay Yard, Seattle, December 26, 1959. My Dad had completed his tour on the MV Comet, and we have just returned to our home in West Seattle, following our three years in Prince Rupert. We have all heard on the cop shows “watch your background” before taking a shot at someone. The smoke in this photo is not coming from the locomotive but somewhere over on Salmon Bay. Checking your background is easy to forget in the excitement of capturing a scene. I had just gotten my drivers license and beginning to explore Seattle's railroading venues. 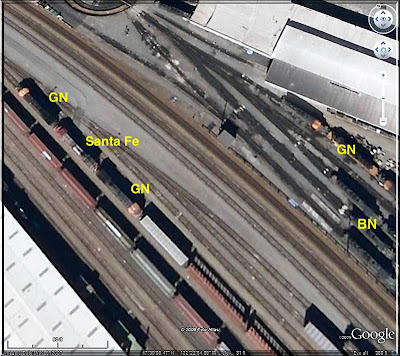 And my, what a potpourri we had to choose from: Northern Pacific, Milwaukee Road, Union Pacific, and Great Northern. Each had its own ambiance. Each had a variety of power packs. And each had provided great opportunities to wander amongst the units and through the engine facilities, with no fuss. Unheard of in today’s environment. 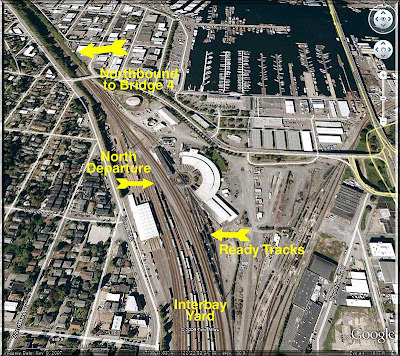 Here we are at Interbay Yard, squeezed between Elliot Bay and the Lake Washington Ship Canal. Northbound traffic out of Interbay lead to Vancouver BC, or, taking a right turn in Everett, the Cascade Mountains and points east! cowling) unit spliced in between two Empire Builder colored units. 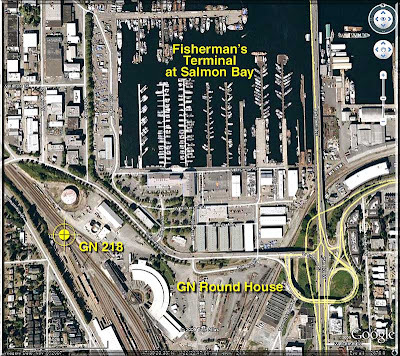 In this view of the yard, you can clearly see Fisherman’s Terminal at Salmon Bay. This is home mooring for many of the vessels you see on the Discovery Channel’s “Deadliest Catch” series. Several years after I took this shot, following my tour in the Air Force, I worked as a country-western DJ, midnight to six. My apartment was on the hillside overlooking the yard, just off the left side of the views shown here. 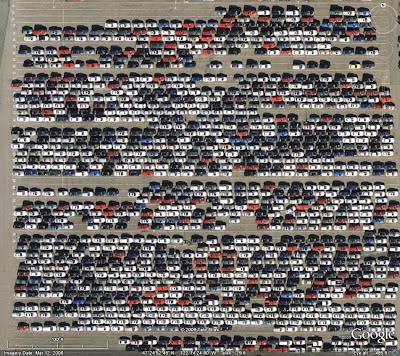 To look at this scene for yourself, plug in “Salmon Bay, Seattle, Washington” into Google Earth and do some exploring! 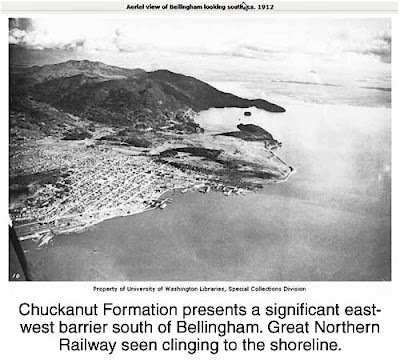 We knew it as Interbay Yard. 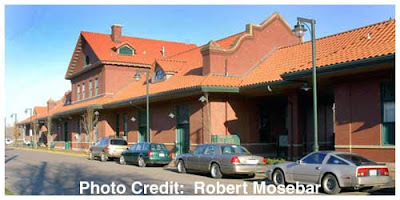 I guess Balmer Yard is the more familiar name now. I am sure much has changed since my last visit 41 years ago in 1968! Railroad Stuff: Great Northern Railway 218, built by ALCo in January 1950, serial number 77893. ALCo RS-2, 1,500 horsepower. GN road class RS-4. Traded to General Electric in February 1965 for a U-boat. Port Townsend, today. I drove down to the bridge yesterday to get these "latest" views for you. I received many interesting questions about my last post, the most common was, why a floating bridge, instead of "bridge" bridge, such as a suspension bridge. As bridge technology has evolved, floating bridges are now correctly referred to as Very Large Floating Structures - VLFS. and fall with tide range up to 16 feet. Floating bridges - VLFS - depending upon the construction site, run anywhere from 4 to 8 times less expensive to build than conventional alternatives. Hood Canal, a long narrow dead end gully carved out by ancient glacial activity, has very poor circulation and thus is slowly but surely silting in, from numerous creeks and streams flowing down into it from the Olympic Mountains. Geologic surveys taken at the narrow throat of the Canal, where the bridge was to be constructed, revealed up to 300 feet of silt at the construction site. One estimate penciled out demonstrated that a structure like the Tacoma Narrows Bridge would have to extend 810 feet high from bedrock - 500+ feet beneath the surface. That is taller than the Columbia Tower in Seattle. 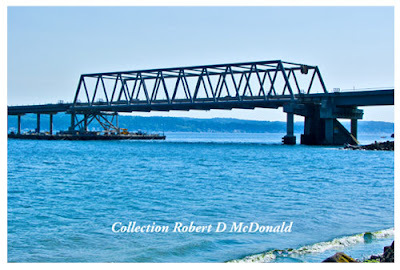 Total cost would be about $4 billion –eight times the cost of the Hood Canal Bridge. Ironically, the first recorded floating bridge in he US was a railroad bridge, constructed 1874 crossing the Mississippi River. It was a combination of pile structure and wooden floating boxes. I'd call it a four-shot bridge. I I were the locomotive engineer, I'd need four shots before crossing it! Apparently there are 11 floating bridges in the world. 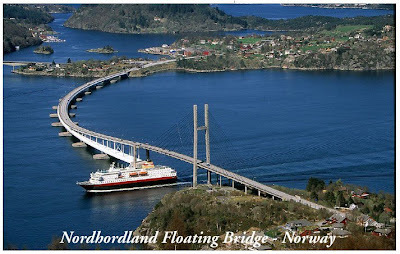 I think the most unusual and graceful being the Nordhordland Bridge located near Bergen, Norway, a combination cable-stay and floating structure. 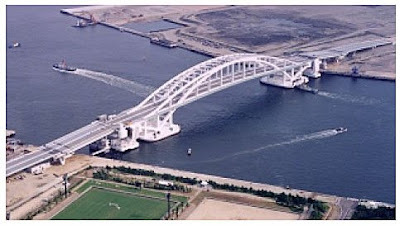 What makes this VLFS unique is that this bridge is the longest free-floating unsupported span in the world. There are no underwater anchor cables! And, the most unusual, a swinging floating bridge, the Yumenai Bridge in Japan. She opened in 2000, and requires tugboats to swing it open around the pivot pier for large vessels. In my overly zealous attempt to get rid of stuff, I've been tossing tons of magazines, books, articles, photographs and other flotsam and jetsam. I came across an old copy of "Pacific Northwest Magazine" written on the occasion of the reopening in 1982 of the Hood Canal Floating Bridge, following its dramatic sinking in a storm in 1979. The article recounted the terrifying experience of a truck driver who ventured eastbound onto the storm tossed bridge only to find the navigation opening at the far east end opened. The theory being to relieve pressure on the structure from wind and waves. The magazine has changed over the years since 1982, and I finally gave up trying to figure out how to find the article. Mentioning this to the staff at the Washington State Department of Transportation, I was stunned to open my mailbox, to find that the Staff had located that magazine issue, and Joe Irwin at WDSOT sent me an Adobe PDF file of what I thought was lost forever! 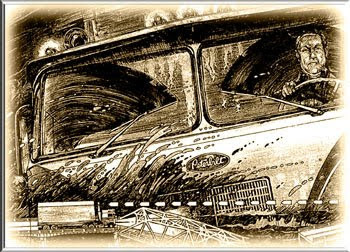 Those who are interested in reading the full-length article about Red Taylor, a trucker caught on a disintegrating bridge over Hood Canal, will enjoy this read and the lessons learned from that sinking. Click on the PDF logo and read it just as it was published in 1982. And my sincere gratitude to the Staff at WSDOT! I mentioned in my previous post that many lessons about floating bridges have been learned over the years - many lessons learned the hard way. 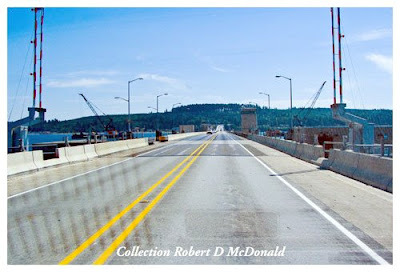 Now, on all of Washington States four floating bridges, during a storm, once winds are clocked over 50 miles per hour, in a 15 minute period, the bridge is closed. No discussion. And remote controlled barricades prevent traffic from inadvertently venturing into harms way. And of course, traffic cameras monitor all activities on the structures. I received another email today from Joe Irwin at the Washington State Department of Transportation. The "Content" line was simply "Aha!" 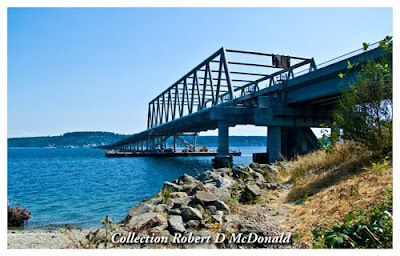 I had queried him about video recordings showing how the new Hood Canal Bridge opens. Since the contractor had to demonstrate some 20 or so continuous open and close sequences to get their "write off" I figured some one must have recorded it. Sure enough. My thanks to Joe Irwin at the Washington State Department of Transportation. Bridges, for the most part, are structures we cross without giving them much thought. I hope you've enjoyed learning a little more about this unique variety, the Very Large Floating Structure!